A previously unknown collection of rare colonial drawings from 1818, including landscapes and Aboriginal portraits from the Newcastle area, has been unveiled after being discovered in the back of a cupboard in Canada. It's called the Wallis Album. This extraordinary piece of Newcastle's colonial history was revealed publicly for the first time at the city's art gallery in a special event. The album was compiled by Captain James Wallis, who was Commandant of the Newcastle penal settlement from June 1816 to December 1818. Its 35 works include many by convict artist Joseph Lycett, whom Wallis developed an association with after he was sent to Newcastle in 1815 for re-offending. The album was discovered in a cupboard at the deceased estate of an elderly man in Ontario, Canada, in October last year. Until then, no-one had been aware of its existence. "When they were rummaging through the effects this album popped up," says Mitchell Librarian Richard Neville. "It was an extraordinary thing." It's unknown how the album made it to Canada, but it may have been passed down through family generations. Because the album had not been opened for many years, the paintings are in good condition. The Wallis Album was recently purchased by the State Library of NSW for $1.8million and will be displayed at Newcastle Art Gallery until February 26. 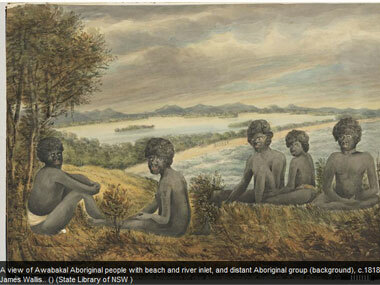 NSW Arts Minister George Souris describes it as a "vital piece of colonial history for Newcastle and Australia". Richard Neville says portraits of Aboriginal people from this region and era are extraordinarily rare, and shows that Wallis enjoyed a certain familiarity with the Indigenous people during his time in Newcastle. Once the album arrives at its new home in the Mitchell wing of the State Library of NSW by the end of the year, it will be posed on the library's website for public viewing.